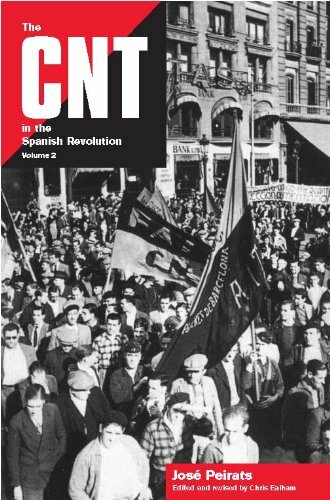 THE CNT in the Spanish Revolution (Volume 2) est le grand livre que vous voulez. Ce beau livre est créé par José Peirats Valls. En fait, le livre a 586 pages. The THE CNT in the Spanish Revolution (Volume 2) est libéré par la fabrication de ChristieBooks. Vous pouvez consulter en ligne avec THE CNT in the Spanish Revolution (Volume 2) étape facile. Toutefois, si vous désirez garder pour ordinateur portable, vous pouvez THE CNT in the Spanish Revolution (Volume 2) sauver maintenant. José Peirats' 'The CNT in the Spanish Revolution' is a landmark in the historiography of the Spanish Civil War. Without it, the role of anarchism in that conflict could never be reconstructed. It is effectively the official CNT history of the war, passionate, partisan but, above all, intelligent. Its huge sweeping canvas covers all areas of the anarchist experience — the spontaneous militias, the revolutionary collectives, the moral dilemmas occasioned by the clash of revolutionary ideals and the stark reality of the war effort against Franco and his German Nazi and Italian Fascist allies. Originally published in Toulouse in the early 1950s, it was a rarity anxiously searched for by historians and others who gleefully pillaged its wealth of documentation. Even its republication in Paris in 1971 by the exiled Spanish publishing house, Ruedo lbérico, though welcome, still left the book in the territory of specialists. For that reason alone, the present project to publish the entire work in English is to be applauded. However, there are various other reasons why this new edition is an obligatory purchase for any serious university library and indeed for all those interested in the history of both the Spanish Civil War and of anarchism in the twentieth century. In the first place, neither of the previous editions, despite their immense scale, had detailed indexes. Inevitably that rendered them difficult to use. Now, this edition is carefully indexed in a way that converts the work into a usable tool for historians and makes it much easier for the general reader to dip in with greater purpose and pleasure. Furthermore, these new volumes are accompanied by superb introductions and detailed notes supplied by Chris Ealham. The notes are fascinating, full of erudition lightly worn. Not only do they turn the volumes into a splendid aid to research, but the astonishing tale of starvation, prison and exile that lies behind the saga of the book’s completion is compellingly readable and a minor classic of historical reconstruction. The Cańada Blanch Centre for Contemporary Spanish Studies is proud to be associated with this magnificent project.